Reg-ent continues its growth trend and looks ahead to new value propositions. Another year and another thank you to our members and their practices for their commitment to Reg-ent. Reg-ent continues to grow and now includes over 2,500 clinicians from over 460 practices representing academic medical centers, health systems, large private practices and networks, and small-to-mid-size private practices. To date, the Reg-ent data repository contains over five and a half million unique patients and 11 million patient visits. We continue to onboard new members and their practices and look forward to the continued growth, development, and diversification of the Reg-ent registry in the coming years. CMS quality reporting [PQRS in 2016 and then Merit-based Incentive Payment System (MIPS) starting in 2017] was Phase One of the Reg-ent registry. As Reg-ent continues its migration to research and analytics, private payer quality programs, contribution to maintenance of certification, and further quality measures development, the benefits of registry participation will be enhanced. As a CMS-designated Qualified Clinical Data Registry (QCDR) and Qualified Registry (QR) for 2017, Reg-ent was able to support the full 2017 reporting needs of our members. Through Reg-ent, participants were able to report on all three of the required MIPS performance categories: Quality, Advancing Care Information (ACI), now changed to Promoting Interoperability (PI), and Improvement Activities (IA). More than 700 clinicians reported MIPS 2017 via the Reg-ent registry, a six-fold increase from the 121 clinicians who reported PQRS through Reg-ent in 2016. Looking ahead to MIPS 2018, the Reg-ent registry is offering 18 QCDR specialty-specific measures for MIPS reporting. These specialty measures will be available only within the Reg-ent registry—once again designated by CMS as a QCDR and QR for 2018. For more information on Reg-ent’s QCDR measures, visit: www.entnet.org/2018-measures. Please also read the article titled “The mechanics of measurement” on page 27 in this issue to learn more about AAO-HNSF measures development. These measures are critically important to reporting otolaryngologists, as the measures contained in Reg-ent best represent otolaryngology-head and neck surgery patient care and outcomes. The biggest challenge facing Reg-ent, and all specialty-based registries, is information-blocking by a number of EHR vendors. Reg-ent is addressing these challenges. It met the MIPS 2017 reporting needs for impacted practices by offering a Reg-ent web entry tool for the Quality Performance category, as well as access to the Reg-ent dashboard for both the ACI reporting and attestation and the IA attestation. Reg-ent is working with a subset of Epic sites on alternative pathways to move data from Epic to the Reg-ent registry. As such, Reg-ent is seeing successes with Epic in both the academic and private practice settings, where data is being pushed to the Reg-ent registry. In addition, FIGmd is actively working within Epic’s App Orchard to deliver another technical solution for providing Epic data to all FIGmd-supported registries, including Reg-ent. FIGmd projects that data will be pushed to Reg-ent in this method starting in the third quarter of 2018. FIGmd is also working with eClinicalWorks to create a process by which to push practice data to all registries by the third quarter of 2018. Reg-ent and FIGmd continue to work closely with other EHR vendors and have successfully done so with more than 100 EHRs, including Medent, NextGen, SRS Health, CareCloud, and Waiting Room Solutions, among others. Data is flowing smoothly from these vendors into the registry, which allows for our members to fully participate in the registry and, in turn, contribute data to the data repository. To the right is a table of the top 10 EHRs represented within the Reg-ent practice community. 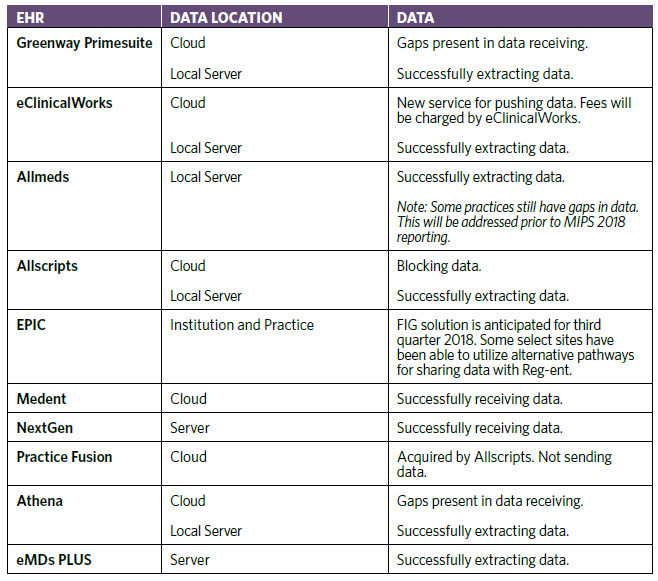 This table provides details on each vendor solution as it pertains to accessing data from the EHR and providing it to Reg-ent. For a complete listing of EHRs that Reg-ent works with, please see www.entnet.org/content/regent-compatible-emrs-and-practice-management-systems. Going forward, Reg-ent will be investing in the infrastructure for advanced data analytics and research. The registry needs you to invest with your participation. The power of the registry is in the data—the more participants, the more data, and the more we can optimize the power of the data for research, advocacy, and defining quality care. We encourage all members to invest in Reg-ent. 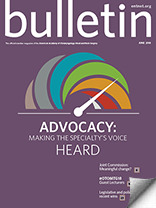 Participants in similar specialty-based registries have realized financial benefit from their participation, as the aggregate data has been used to value treatment options as well as to provide data to support advocacy efforts. Reg-ent is looking forward to launching a private payer pilot in late 2018 and to offering the capacity to support research in 2019. We urge you to participate in the most significant quality improvement initiative of the AAO-HNSF. Join today at https://regent.entnet.org/Signup/registry.aspx.